Resistors are available in a large amount of different packages. Nowadays the most used are the rectangular surface mount resistors, but also the good old axial resistor is still used extensively in through hole designs. This page will inform you about the dimensions of SMD, axial and MELF packages and about the required land patterns for SMD components. 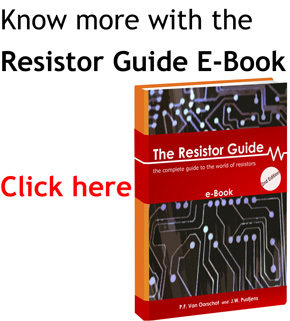 The shape and size of surface mount resistors are standardized, most manufacturers use the JEDEC standards. The size of SMD resistors is indicated by a numerical code, such as 0603. This code contains the width and height of the package. So in the example of 0603 Imperial code, this indicates a length of 0.060″ and a width of 0.030″. This code can be given in Imperial or Metric units, in general the Imperial code is used more often to indicate the package size. On the contrary in modern PCB design metric units (mm) are more often used, this can be confusing. In general you can assume the code is in imperial units, but the dimensions used are in mm. The SMD resistor size depends mainly on the required power rating. The following table lists the dimensions and specifications of commonly used surface mount packages. When designing with surface mount components the right solder pad size and land pattern should be used. The following table shows an indication of the land pattern for common surface mount packages. The table lists the dimensions for reflow soldering, for wave soldering smaller pads are used. The size of axial resistors is not as standardized as the SMD resistors and different manufacturers often use slightly different dimensions. Furthermore the size of an axial resistor depends on the power rating and the type of resistor such as carbon composition, wirewound, carbon or metal film. The following drawing and table give an indication of the dimensions of common carbon film and metal film axial resistors. Whenever the exact size needs to be known, always check the manufacturer datasheet of the component. Sometimes surface mount resistors are also used as MELF packages (Metal Electrode Leadless Face). The main advantage of using MELF in stead of standard SMD packages is the lower thermal coefficient and better stability. The TCR of thin film MELF resistors is often between 25-50 ppm/K while standard thick film SMD resistors often have a TCR of > 200 ppm/K. This is possible due to the cylindrical construction of MELF resistors. This cylindrical construction also gives the package distinct disadvantages, mainly when the components have to be placed using pick and place machines. Because of their round shape a special suction cup and more vacuum is required. There are three common MELF package sizes: MicroMELF, MiniMELF and MELF. The following table lists the characteristics of these types.